Of all the sugar-filled holidays, Halloween is the time of year when candy is king. Even weeks before trick-or-treating night, mountains of foil and plastic-wrapped goodies are everywhere: supermarkets, drugstores, craft stores and everywhere else you turn. If you try to limit your kids’ or your own sugar intake, or take extra care when it comes to synthetic flavors and colors or common allergens, this can present a conundrum. Just because you’re vegan, gluten-free, nut-free or simply try to avoid processed food doesn’t mean you shouldn’t get to indulge in Halloween sweets. Luckily, Kimberton Whole Foods is stocked and ready for the season with an incredible selection of natural, better-for-you candy options, including so many that are organic, gluten-free and non-GMO. The best part is that these candies are so good, you can substitute them for all of the brand-name treats you grew up with (nostalgia is a crucial ingredient in candy!). The only things you’ll miss are the additives, artificial colors and corn syrup. Come to think of it, you won’t actually miss those at all. Nothing screams Halloween quite like candy corn. These brightly colored kernels give a little wink to the harvest season, with a hint of roasty caramel flavor and a fudgy, chewy texture that makes them oddly appealing. 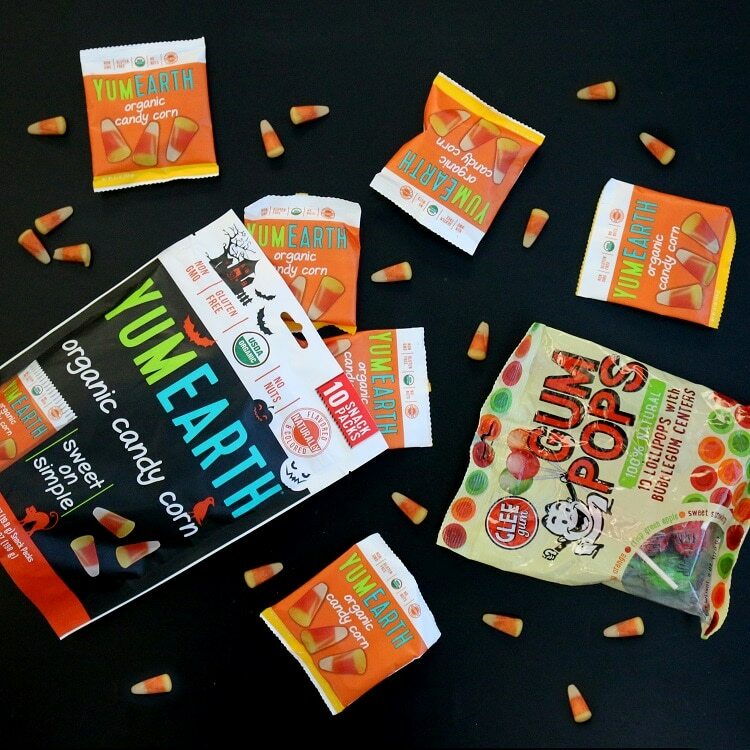 YumEarth, a Connecticut-based company founded in 2007 by two young dads, has created an organic candy corn that checks all the flavor boxes, but leaves out all of the junk. The orange and yellow colors are slightly more muted than the stuff of your childhood, but that’s because annatto and turmeric are used in place of spooky dyes. 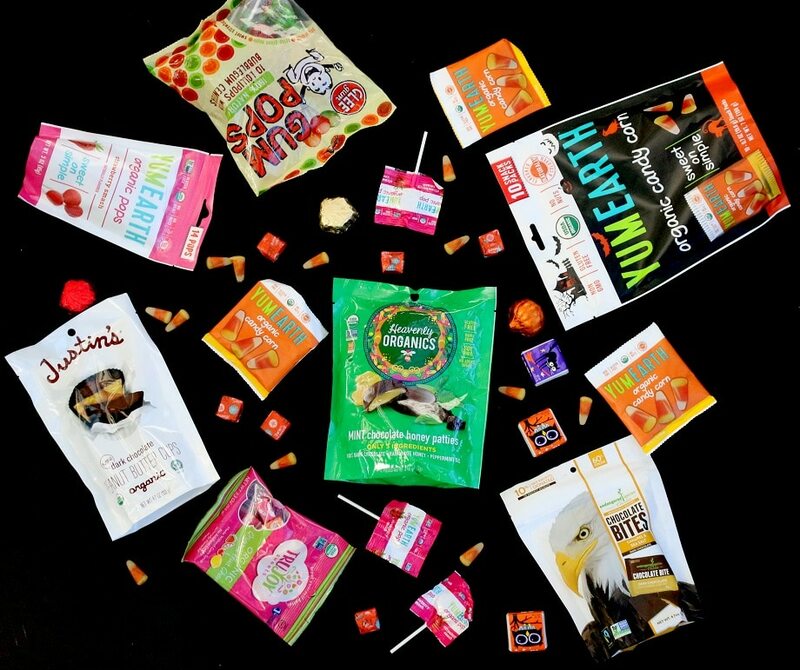 KWF sells these in packages of 10, 0.7-ounce individually wrapped packs, perfect for goodie bags or trick-or-treating. Fun fact: Candy corn was originally invented in the 1880s in Philadelphia by the Wunderle Candy Company! There’s something about a gum-filled lollipop that kids can’t get enough of—perhaps because it’s like getting two treats in one? Glee Gum’s all-natural version will also make parents jump for joy, with annatto, beet juice, chlorophyll and turmeric used in place of the D&C Red 40 and FD&C Blue 1 found in conventional products. 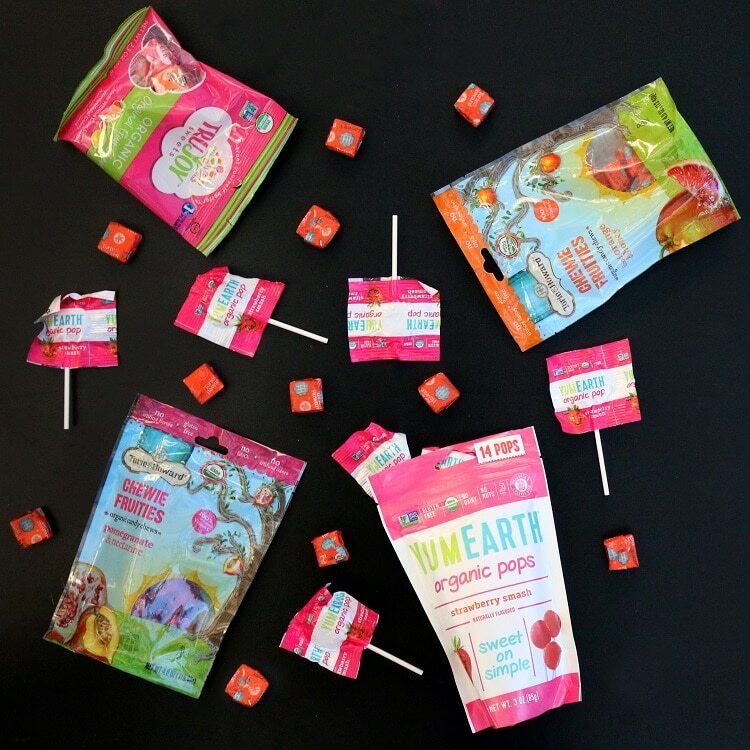 The generously sized pops come in a mixed flavor bag, offering crisp green apple, sweet strawberry and juicy orange flavors that definitely won’t end up in the “trade” pile. Fun fact: Most modern gum is made with a synthetic gum base; Glee Gum uses chicle, a tree sap harvested sustainably from the rainforest of Central America. Besides chicle, the only ingredients are calcium carbonate, candelilla wax and dehydrated citrus peels. No synthetic resins in sight! Halloween would be incomplete without a big handful of wax paper-wrapped fruit chews, a pleasant alternative for anyone who can’t eat or doesn’t enjoy chocolate. Torie & Howard, a small candy company that primarily makes fruit-flavored treats, crafts delightfully soft, bite-sized chews in grown-up flavors like pomegranate & nectarine and meyer lemon & raspberry. With no additives, artificial flavors or colors, you can indulge in a handful or two without worrying about suspicious dyes, waxes or binders. The use of brown rice and cane syrups also lends a more gentle sweetness than the tooth-aching conventional fruit chews. These are available individually wrapped in four-ounce bags. Fun fact: Torie and Howard are a married couple who started their company after they each experienced a health-related event (severe allergies and dramatic weight loss, respectively) that significantly impacted their lives. These are simple, straightforward lollipops, perfect for younger kids. Like all other YumEarth products, these are made in a peanut-free facility, making them a great treat for a peanut-free classroom! The strawberry flavor actually tastes like fruit (imagine that! ), and the pretty magenta color comes from blackcurrant and black carrot juice concentrate, not Red 40. YumEarth Organic Pops come 14 to a bag, individually wrapped in cheerful packaging. Fun fact: Many red and pink candies use a “natural” food coloring made of insects called carmine—definitely not suitable for vegans! Black carrots and blackcurrant extracts provide a vibrant, animal-free alternative. There more benefits to naturally flavored candy than the absence of dyes and chemicals. One serving of TruJoy Sweets’ fruit chews actually contains 80% of your daily recommended vitamin C! The orange, cherry, lemon and strawberry chews certainly don’t taste like vitamins, though—organic sweeteners and fruit juice give them a tasty pop of flavor, and their expert formulation makes them just as wonderfully soft and chewy as conventional types. 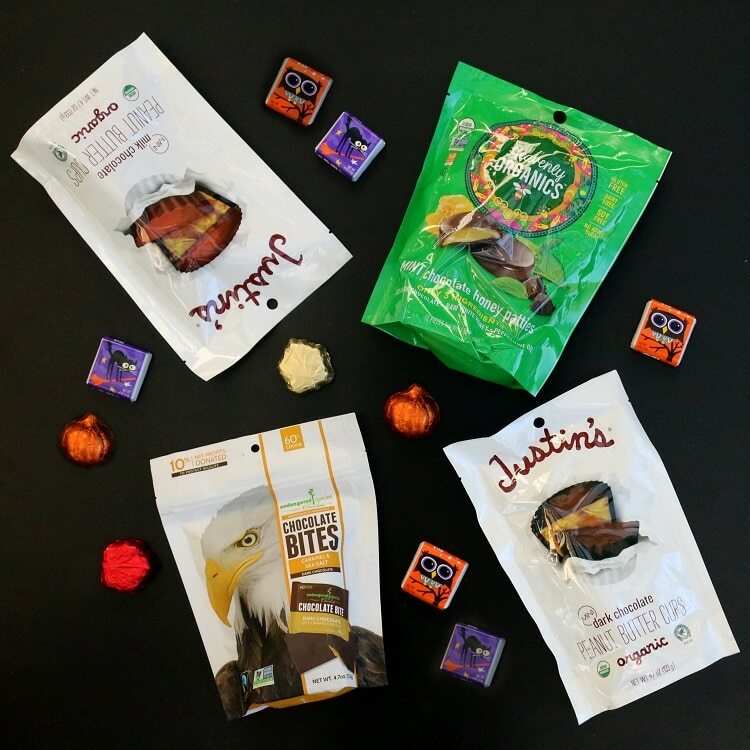 Pick up a few mixed flavor 2.3-ounce bags, sure to make trick-or-treaters smile. Fun fact: TruJoy Sweets is a socially responsible company and a proud member of 1% for the Planet. If you’re throwing an adult Halloween party, here are the sweet treats to serve. These decadent, individually wrapped squares from Endangered Species Chocolate feature rich dark chocolate with a gooey ribbon of caramel in the center. A touch of Himalayan sea salt balances the velvety sweetness, making for an altogether luscious bite. The chocolate is made using fully traceable Fair Trade beans from West Africa, and the caramel is crafted with all-organic ingredients. Each 4.5-ounce bag contains about 10 chocolate squares. Fun fact: Endangered Species Chocolate has donated over $1.3 million of product sales in the past three years to wildlife advocate organizations around the world, such as The African Wildlife Foundation. If you’ve never tried a Justin’s peanut butter cup, you are seriously missing out! You can find a tempting variety of Justin’s products (including jars of rich nut butter) at KWF, but this bag of individually wrapped minis is trick-or-treat ready. Boasting 100% organic ingredients, including Rainforest Alliance Certified cocoa and sustainably harvested palm fruit oil, these adorably sized dark chocolate cups are filled with perfectly salted peanut butter. The 4.7-ounce bag is a must-have for Halloween, though we won’t be surprised if you’re back soon for another bag to keep all to yourself! Fun fact: They’re also available in milk chocolate! When the mood for mint and chocolate strikes, nothing else will do. It’s just too bad that often, the candies offering those flavors are so saccharine sweet, you can practically feel the cavities coming on. Not so with the mint chocolate honey patties from Heavenly Organics, a family-owned company based in Iowa. Made with just three ingredients: raw organic white honey, unsweetened organic dark chocolate and natural peppermint oil, these reach the perfect mint chocolate note. The honey is sustainably harvested from naturally occurring beehives in the Himalayan Mountains, and all three ingredients are Fair for Life Certified. KWF carries these in 4.66-ounce bags, each of which contains 12 individually wrapped patties. Fun fact: Check out this video to learn more about Heavenly Organics’ incredible wild honey harvesting methods, which protect wild bee colonies and help prevent forest fires. These gourmet chocolates from Vermont come in the cutest seasonal packaging. Lake Champlain Chocolates’ foil-wrapped chocolate leaves in red (peanut butter-filled) and gold (caramel-filled), and orange pumpkins (caramel) capture the colors of fall and make a great little bite for adults with a sweet tooth. If you’ve got any left over after Halloween, unlikely as that may be, these would make a cute touch to a Thanksgiving dessert spread! Kids will love the playfully spooky owl and black cat illustrations on the 0.4-ounce chocolate squares, which come in both dark and milk chocolate. You can give out these minimally processed chocolates resting easy, knowing they’re made from all-organic, Fair for Life-certified ingredients. Fun fact: Lake Champlain Chocolates has been making confections with local honey, maple syrup and fresh cream since 1983—long before “local” was a buzzword, much like Kimberton Whole Foods (established in 1986). If sweet isn’t your thing, or sugar isn’t an option for you or your children, these personal-sized bags of gently salted popcorn from Lesser Evil’s Buddha Bowl line of snacks are the ideal treat. Tender kernels of organic corn are air-popped and then kissed with just a touch of organic extra virgin coconut oil and a dusting of pink Himalayan sea salt. Believe it or not, it’s a Halloween treat with fiber and whole grains! These single-serve, 0.88-ounce bags are perfectly portioned for trick-or-treat giveaways (or lunchboxes). Fun fact: If you’re a fan of Himalayan pink salt, check out KWF’s selection of salt lamps and baking stones! This entry was posted in Grocery Page, Staff Favorites and tagged autumn, candy, Chocolate, dessert, Fall, halloween. Bookmark the permalink.